Corn returns in 2014 likely will be negative on many farms, with losses near $100 per acre on cash rent farmland in northern Illinois (farmdoc daily, October 24, 2014). Projections indicate that soybeans will be more profitable than corn in 2014. Having a higher return for soybeans is unusual and may have implications for 2015 planting decisions. Table 1 shows projected returns for corn and soybeans grown in central Illinois on high-productivity farmland. Corn has a projected yield of 220 bushels per acre while the soybeans has a projected yield of 65 bushels per acre. Both of these yields reflect exceptional yields occurring on most Illinois farms. Projections use a $3.40 per bushel corn price and a $10.00 per bushel soybean price. Both prices are at the midpoint of the range given in World Agricultural Supply and Demand Estimates (WASDE) released by the U.S. Department of Agriculture in October. These WASDE prices currently are above cash bids farmers are receiving for crop sold directly out of the field. Also included in revenue are projected ARC/PLC payments of $50 per acre. Costs shown in Table 1 come from 2014 Illinois Crop Budgets. Total costs equal $588 per acre for corn and $372 per acre for soybeans. Operator and land return equals gross revenue minus total costs and represents a return to both the farmer and landowner. Operator and land return equals $210 per acre for corn and $328 per acre for soybeans. Given projections in Table 1, soybeans are projected to have a $118 per acre higher return than corn. Corn price increases to $3.93 per bushel rather than the projected $3.49 per bushel. Soybean price decreases to $7.50 per bushel rather than the $10.00 per bushel. Soybean yield decreases to 49 bushels per acre rather than the projected 65 bushels per acre. The sizes of the above changes illustrate that soybeans will be more profitable than corn in most situations. Average cash rent in central Illinois is near $300 per acre. At a $300 cash rent, farmers receive a return for corn equal to -$90 per acre ($210 operator and land return – $300 cash rent). The farmer return for soybeans equal $28 per acre ($328 operator and land return – $300 cash rent). A 50% corn and 50% soybean is a common division of land between corn and soybeans. 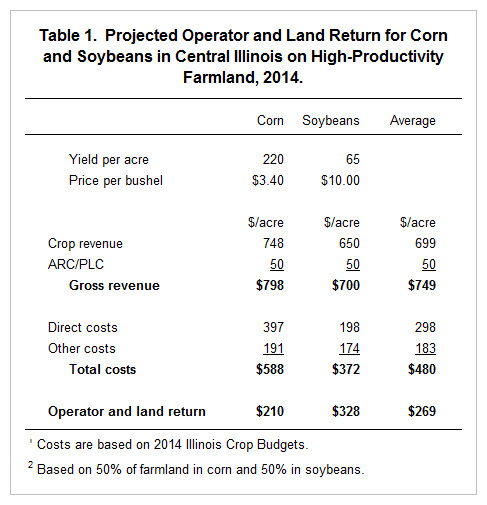 At a 50% corn and 50% soybeans, operator and land return equals $269 per acre (see Table 1). Overall, a $31 loss occurs for a farmer given a $300 cash rent. Without soybeans, the return would have been much larger. Unlike most years, soybeans are projected to be more profitable than corn in 2014. Those farms raising more soybeans this year will tend to be more profitable than those raising more corn. The 2014 projections may hold implications for shifts in acres in 2015. Similar to 2014 returns, return projections for 2015 suggest that soybeans will be more profitable than corn. Central Illinois has a larger comparative advantage in corn production over soybean production than many other areas of the United States. Hence, relative return differences between corn and soybeans likely are larger outside of central Illinois. Hence, economic incentives to switch acres outside of Illinois likely will be larger than those for central Illinois. Schnitkey, G. "Cash Deficits Projected for Corn in 2014 and 2015." farmdoc daily (4):206, Department of Agricultural and Consumer Economics, University of Illinois at Urbana-Champaign, October 24, 2014.